It wouldn’t be unfair to suggest that console to mobile ports don’t generally turn out too well. In fact, for the most part, they usually end up as a digitally crafted heap of festering puss that you can carry around with you in your pocket; holding similar kindred to a hastily discarded lump of snot in the absence of a handkerchief. With EA Sports UFC though, the Cthonic, many-tentacled corporate entity that is EA has actually done a fair job of bringing the fist-to-face spectacle of Mixed Martial Arts kicking, screaming and tapping to mobile platforms, even if some depth has been sacrificed in the process. In slimming down EA Sports UFC from its console iteration, the mobile version of the game only really boasts a linear career mode where players take a fighter through a gauntlet of increasingly difficult tussles as they level up their stats and gain extra abilities. A free-to-play game, EA Sports UFC has its own in-game currency split into a regular and a premium tier. The former is mainly used to upgrade moves and purchase extra fighters of a lower quality, while the latter is used to splurge out on deluxe packs that include top-range fighters and much more besides. The character models and animations are surprisingly true to the console versions of the game. Quite happily then, I can report that you can play the game quite happily without spending a single penny/dime of real life scratch. Sure, if you want to play as the different fighters or accelerate your progress then your wallet is going to be in for a fair bit of pain, otherwise though, the game does a decent enough job of funneling enough of the non-premium currency to the player in order to keep your fighter competitive and the game enjoyable. Further aiding this aspect of things are the ‘enhancers’ that you can apply to a fighter up to ten times a day. These essentially provide a stat boost to allow the player to overcome especially difficult fights and it does well in keeping the player progressing throughout the career mode by eradicating much of the grind work that usually accompanies free-to-play efforts. When it comes to the fights themselves, it becomes quite clear that it’s here where the biggest cuts have taken place. Instead of being able to exercise full control over your fighter, EA Sports UFC Mobile allows strikes to be thrown, attacks to blocked and evaded but otherwise, you never really feel that you have full control over your fighter as you do in the console versions of the game. 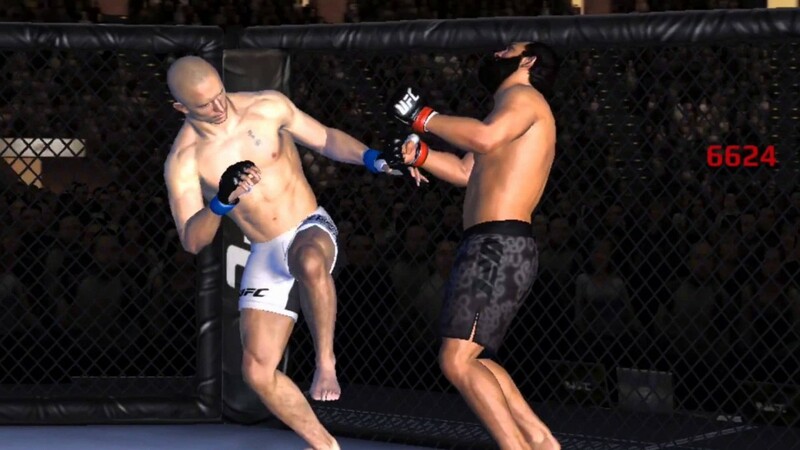 Of course, it’s probably a little churlish to criticize the game for streamlining itself in this regard, especially as the touch-input control system doesn’t allow for much complexity, but nevertheless EA UFC players who are used to the PS4 and Xbox One versions of the game will find the comparable lack of player control to be jarring all the same. Still, that shouldn’t suggest that the gameplay itself is without some degree of skill however. Players can pump jabs at the opponents head or body depending on where you tap on them or rip kidney-rupturing hooks to the body or teeth-rattling uppercuts to the jaw, while slipping strikes and blocking attacks at the right time can lead to counter attacks which do extra damage. The takedown and submission systems, on the other hand, are handled via golf-style swing-bars and button-mashing QTE’s. To be fair, given the limitations of touch screen input and the vast complexities of the MMA ground game that the home console versions can’t even get properly right, such concessions to accessibility seem well judged in this instance. From face-smashing superman punches to thundering slams, many of the actual attacks used in the sport have successfully made the transition to mobile. Perhaps the biggest problem with the combat though, lies in the lack of tactical application that is so prevalent in the real thing. You see, rather than being able to initiate a takedown or a clinch whenever you like, you’re instead forced to wait for that move (or ability, as they’re called here) to appear in your queue before you can use it. Put simply, you can go multiple fights in a row without ever being able to perform takedown simply because you weren’t lucky enough to have it in your ability queue. It’s a strange system all told that ultimately fails to convey the spontaneous switch of offensive strategies that the multi-faceted sport of MMA is renowned for. Undeniably, for a mobile title especially, EA Sports UFC Mobile is quite the looker. With over seventy very different and detailed fighters and with reams of animation liberally ripped from its visually spectacular home console counterparts, EA Sports UFC Mobile is among the very best looking sports games available on mobile platforms. At the end of the day, EA Sports UFC Mobile doesn’t have the depth of the console games that it partially shares its namesake with but its concessions to accessibility and deft adoption of the free-to-play model have been well-judged for the most part. 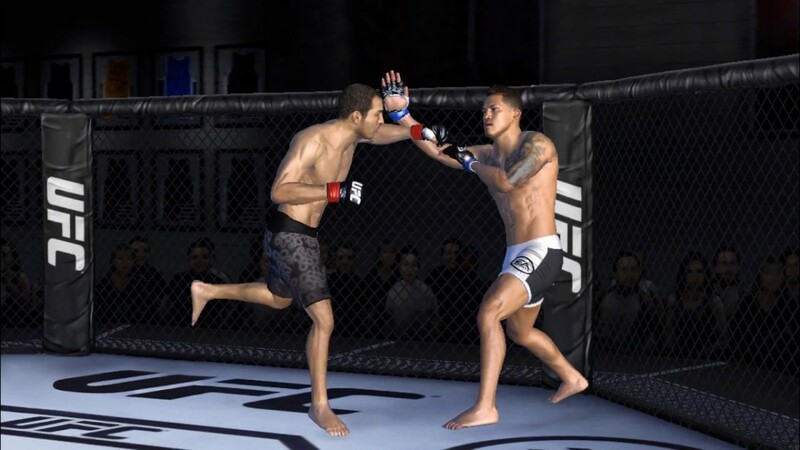 Creating a bite-sized MMA experience that looks the part and can be easily enjoyed in short bursts for no cost, EA Sports UFC Mobile might not be as real as it gets, but it arguably represents a positive and effective direction for future MMA titles on mobile platforms to follow. A copy of the game was independently obtained by the reviewer and reviewed on a Samsung Galaxy Note 4 handset. iOS players can grab the game here, while Android folks can nab it from here.